I had the opportunity to get back into the Pitts yesterday and when I saw the two of them together I had to take a picture. 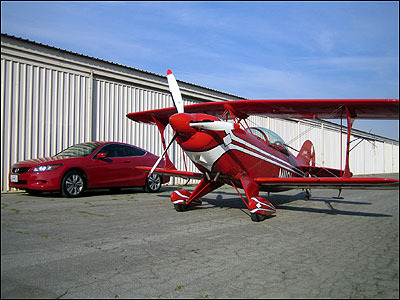 It’s so rare that both the car and the plane are clean at the same time. I was out at CNO to take Dan for a flight. His flight review (an FAA-mandated recurrent training requirement) was due and I owed him a favor for ferrying me out to Borrego last fall. 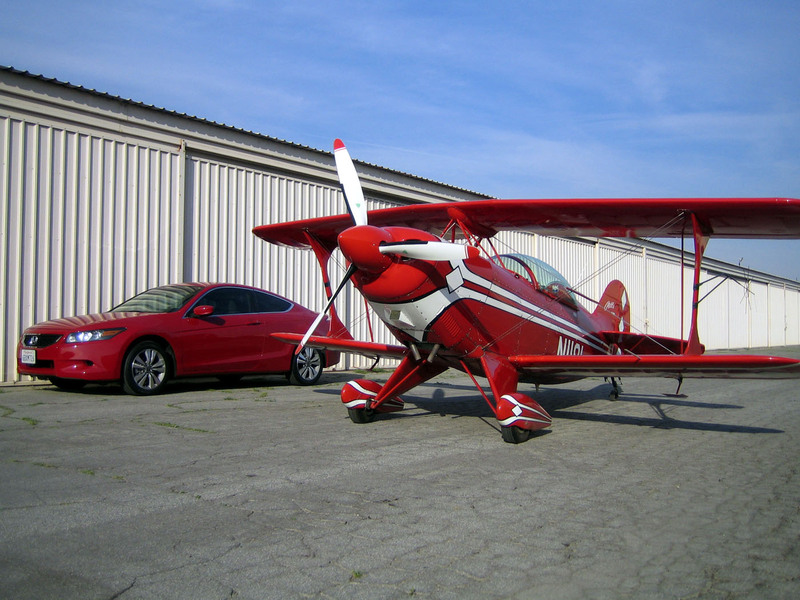 I had needed to get out there to retrieve the Pitts after the Acrofest. I was the Contest Director for that competition. And a competitor. And a judge. And… I’ll never do that again. It was a crazy time, even by my standards. Anyway, Dan wanted to try some advanced spin training as part of his flight review, so we focused on flat and accerated spins modes. 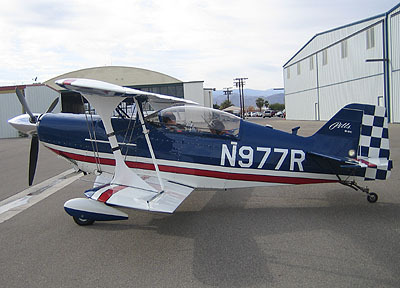 After that, I went up for a solo flight to work on the 2007 intermediate known sequence. I’m trying to get an early start on preparing for the upcoming competition season. 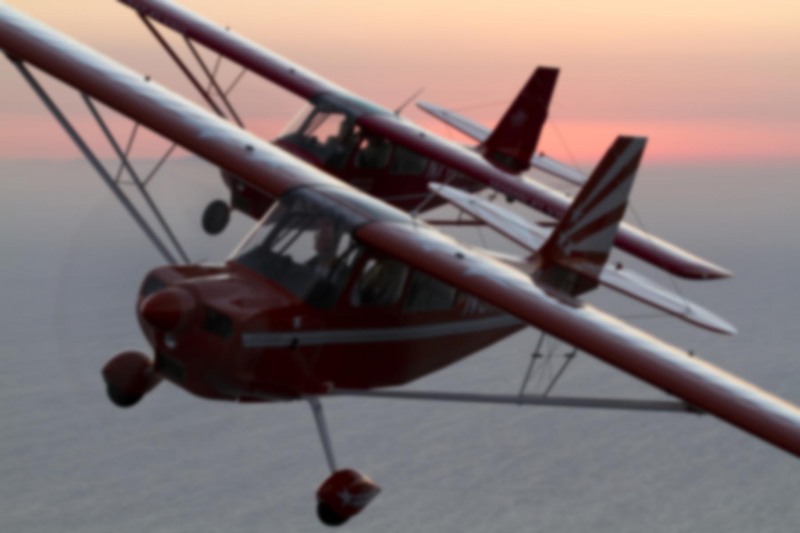 The 2007 season was basically missed by all of us at Cloud Dancers because the airplane was undergoing a particularly heavy maintenance interval which lasted for most of the spring and summer. The timing was unfortunate, but after the aircraft came off leaseback it only made sense to get it into good working order. The wings were off, the prop was overhauled, fabric & paint were touched up, the top end was overhauled, and she was cleaned, rigged, inspected, and so on. When I got back to Chino, I spent some time just shooting landings in the pattern. It’s such a blast to go from 1300′ AGL to zero in about 15 seconds. The airplane pretty much climbs at the same rate. I had forgotten how much sprightlier the S-2B is when flown solo vs. with two people on board. Losing that 200 lbs up front really makes a difference! Hot damn that is one beautiful sight up top. Very nice! Nice to see 1191 looking spry. Best flying Pitts S2 special ever. And I compared it to a lot of others. Thanks, Tim… we recently put 1191 through a virtual rebuild. Paint and fabric work, top overhaul, prop overhaul, re-rigging, all sorts of stuff was done to get it in tip-top shape, and the dispatch reliability has been 100% since then!